One of the things I really appreciate about Boruto, is that its going to places where its predecessor series, Naruto didn’t. A few weeks into Naruto, we saw Naruto become a Genin and his story quickly shifted into the Chunin exam and then other, more complicated things. With Naruto, we never really got a chance to see his academy days too closely, nor did we really see that part of the Konoha “world” for that matter. Which is why, despite how seemingly average these first few stories are, I’m enjoying them quite a bit. There’s nothing entirely new or special to be had in this week’s episode, for instance. 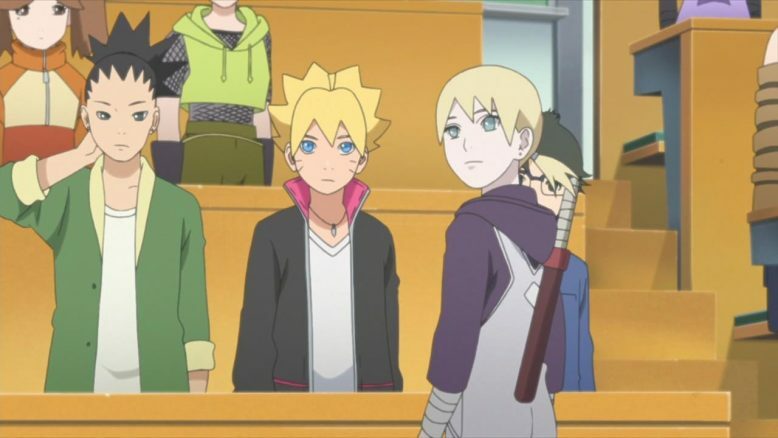 Boruto finally arrives at school after being suspended for two weeks following what happened last episode. Everyone hates him and thinks he got off easy, but Boruto ultimately wins everyone over by not only defeating the class bully, but turning him over to “his” point of view. Its a classic feel good story that I think you’d see younger viewers enjoying a lot. No one really gets too hurt, and everyone ends up winning. Its a story we’ve seen before, but I like how Boruto adapts it to the Shinobi world, and makes it feel cohesive and normal. Its impressive to see kids who are basically learning how to be fighters and assassins, run into weird complexes and issues. If there’s one thing that worries me a bit, its the repeated mention of Naruto himself. 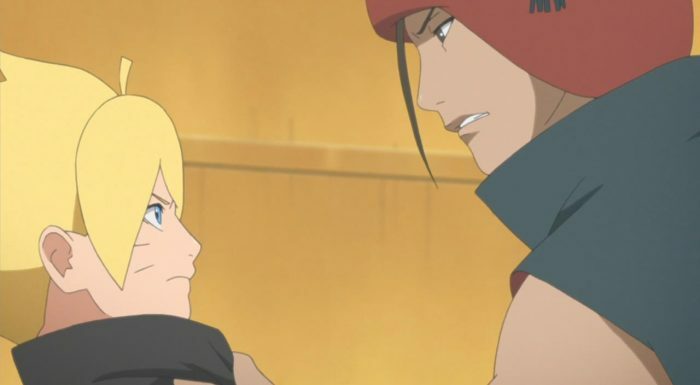 I get that the first episode had to focus Boruto and his relationship to Naruto, and I get that everyone in the village reveres Naruto, but I really wish we’d stop hearing about the last Ninja war and all of that. Its easy to just go back to what happened before, and have it inform events that are happening now, But I really do want to see Boruto carve out its own niche, and not rely on too much on what came before. To that end, I REALLY like how Boruto continues to set himself apart from Naruto. Unlike Naruto, Boruto is actually pretty good at making friends and is pretty darn friendly. He’s simply put, a much better kid than his father was at the age he’s at. Boruto isn’t a trouble maker as a much as he is someone who just can’t ignore wrong, the rules and his own circumstances be damned. 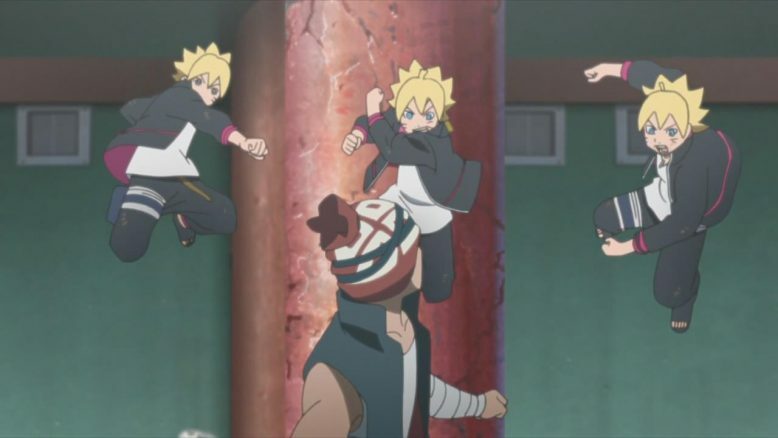 Its something that Naruto learned a lot later in life, and its nice to see that that particular trait not only rubbed off on Boruto, but is actually manifesting a lot early. To that end, its interesting seeing all the other kids of famous characters from the first series, kind of show themselves off. There’s enough of a difference there to where we’re not getting the same characters, whereas some characters feel like simply math equations. Sarada, for example, really does feel like a mix between her mother and father at the moment, and I’m really hoping we get to see the character that we saw in the movie, soon. 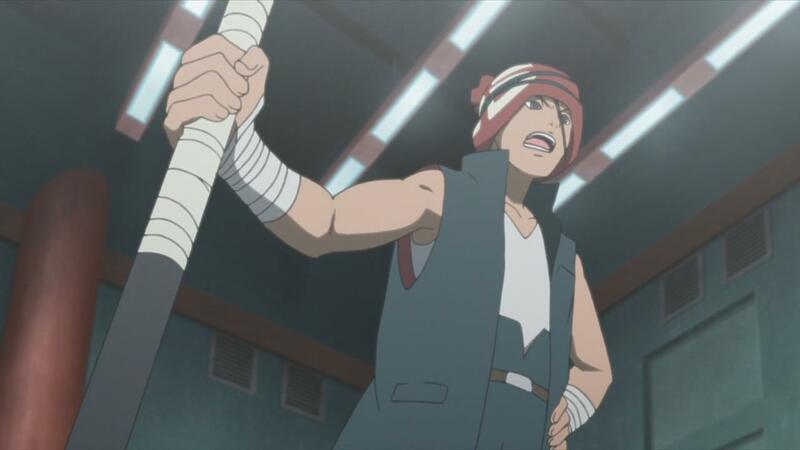 Shikadai and Inojin, on the other hand, feel like almost carbon copies of their fathers, so I really hope the show does something to differentiate them from their parents a bit. There’s still more characters to see of course, so I doubt the show’s done all it can to develop the rather large cast of characters it now has to juggle. And that’s really it. The action is decent (with some lower tier production values), although I’ll be the first to admit that I’m really not watching this show for its fight scenes or battles. The character driven stuff has me engaged, and I’m curious to see how long we stay in the Academy part of Boruto’s life. Either way, I’m still very much into this show, and am excited to see what it offers up next week with “Metal” Lee (Seems like Lee is pretty bad at naming his son…).